SACRAMENTO, CA [March 22, 2019]—Each year, thousands of hikers backpack all or part of the 2,600-mile Pacific Crest National Scenic Trail (PCT), nearly 1,700 miles of which wind through California. A sojourn on the trail for any length requires periodic breaks to re-stock and sneak in some pampering. California inns located close to re-supply points along the trail welcome backpackers with luxurious comforts and home-cooked breakfasts to fuel the rest of the journey. Fifty miles from the Mexican border lies Julian, one of the earliest refueling stops for PCT hikers. Orchard Hill Country Inn, a Craftsman delight just ten miles from the trail, is a welcome respite from the ruggedness of the early trek. The inn is a perfect first reminder of the comforts of home, including whirlpool tubs and outdoor patios and decks from which to admire the peaceful grounds. For a real splurge, hikers might choose the Penthouse: 850 square feet of luxury complete with a king bed, oversized shower, native stone fireplace, and a lovely view of town. The innkeepers will even pick hikers up from the trail, after which the local post office, grocery store, cafes, and bars are all within a short walk. The climb through the wilderness of the San Jacinto Mountains is interrupted a mile up by the surprising civility of Idyllwild. A quarter mile from the center of town, the cedar-shingled Strawberry Creek Inn awaits, offering hikers a welcoming mix of rural charm and upscale amenities. The inn is known for its eclectic décor, gourmet two-course breakfasts, and cozy seating arrangements scattered over an acre overlooking the creek. In town, guests have access to critical necessities like a post office, pharmacy, and grocery stores, but Idyllwild is also blessed with amenities unheard of in most small towns: art galleries, spas, a movie theater, and a plethora of restaurants. High in the Sierras at Carson Pass, hikers can travel about 10 miles in either direction for a relaxing overnight stay. Serving travelers for over 90 years, Kit Carson Lodge lies west of the PCT on the shores of Silver Lake. The seasonal resort is open from June to October and includes a general store, art gallery, boat rentals, and a full-service restaurant serving three meals a day. The rustic lodge offers just enough luxury to complement life on the trail while continuing the theme of staying close to nature. Guests can choose freestanding cabins that sleep up to eight and have fully-equipped kitchens and charcoal grills, or hotel rooms with decks overlooking the lake. East of the trail at Carson Pass and just south of Lake Tahoe, Sorensen's Resort is open year-round and features relaxing amenities like on-site spa treatments, hammocks strung beneath the trees, and a wood-fired sauna. The onsite Sorensen’s Country Cafe serves breakfast, lunch, and dinner, features an exceptional wine list, and will gladly pack a picnic lunch for an exploratory trek among the property’s 165 acres of pine and aspen forest. Weary hikers can choose from cozy bed-and-breakfast cottages, fully-outfitted log cabins, or contemporary mountain homes. Many cabins have wood-burning fireplaces and kitchens. Lake Tahoe's magical west shore offers two enticing lodging choices. A little less than six miles from the PCT via Rubicon Trail, Tahoma Meadows Bed & Breakfast features a row of historic red cottages surrounded by towering pines. With amenities like claw-foot soaking tubs, hammocks, and garden furniture throughout the property, hikers will find themselves refreshed and ready to hit the trails after even a short stay. From the indoor comfort of the inn’s common room, guests can enjoy a majestic view of Lake Tahoe while enjoying a full family-style breakfast. Five miles from the trail and a few steps from one of the finest beaches on Lake Tahoe, Cottage Inn at Lake Tahoe is an enchanting retreat. Dramatic architecture and rustic whimsical touches abound in the studios and suites dispersed among the main lodge and eight cottages, some with two-person jetted or soaking tubs. The inn serves homemade cookies and a hearty country breakfast daily in the dining room, or on a lovely outdoor deck in the summertime. Numerous shops, museums, restaurants, casinos, and arts activities are available nearby, making the Cottage Inn the perfect break from the rigors of the trail. The Donner Lake Inn B&B in Truckee is a short distance from the trailhead on Mt. Judah, near Sugar Bowl Ski Resort. Featuring five mountain-themed guest rooms, the inn welcomes backpackers to a bed with soft linens, a soak under the stars in a hot tub, and a hearty country breakfast. Hikers regularly have clothes shipped to the inn so they have something more comfortable to slip into as they come off the trail. Just across the street, there’s a town shuttle that runs to and from the shopping and dining venues in Historic Old Towne Truckee, where backpackers can restock, resupply, and enjoy a hot meal at any of the many Truckee restaurants. Within 15 minutes of the PCT Mid Way Post (1,321 miles) is the Highlands Ranch Resort, a popular spot for reuniting with family and friends before embarking on the Lassen Volcanic National Park section of the trail. With rustic chic décor and premium amenities, the resort is the epitome of luxury. This stunning 175-acre estate features seven newly-built cottages with luxurious linens, gas-burning fireplaces, natural stone bathrooms with rain shower heads, private patios, and enticing meadow and mountain views. 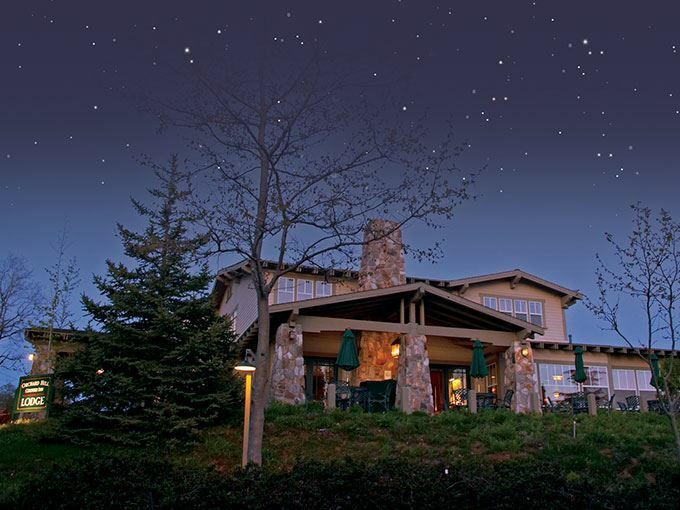 The resort is known for its calm atmosphere, artisan-style restaurant, and full-service bar, and a favorite activity for hikers is enjoying a chef-prepared breakfast on the outside dining deck overlooking the mountain meadow and Lassen Park. North of the PCT in McCloud near Mt. Shasta, two historic hotels await hikers looking to relax and re-energize before heading back out on the trail. Built in 1916 and recently renovated, McCloud Hotel Bed & Breakfast seamlessly fuses modern touches with classic mill town character. Featuring four suites with two-person jetted or copper soaking tubs with separate showers, hikers can easily exchange the grueling physical demands of the trail for deep relaxation. Sage, the hotel’s fine dining restaurant, boasts an imaginative, seasonal menu. The complimentary hot breakfast options includes a long list of tempting options. For more information about these and other California inns, visit www.cabbi.com.